James Baird was born on 30 November 1828 in Saltcoats, Ayrshire county, Scotland. His father was the local postmaster and a weavers' agent. Baird came to Newfoundland in 1844 and worked as a draper's asistant until about 1853 when he established his own importing and draping business with his brother, David. On 8 December 1857 he married Anne Boyd, daughter of merchant John Boyd of St. John's and they had three sons and one daughter. In 1872 James started his own business under his own name and was later joined by his nephew, James Gordon. By the early 1880s the company had expanded into the wholesale and retail of groceries and dry goods and the sale of wines and spirits as well as the fishery supply business. The company was cautious in entering the colony's fish export trade doing so in the mid-1880s and then for only a few years. This proved a sound business decision; having lost his premises in the 1892 fire that destroyed much of St. John's and rebuilding on a much larger scale, Baird successfully survived the financial collapse of the island's banking system in December 1894. Indeed, the company was well-positioned to fill the gap left by several major financially troubled firms and re-entered the fish trade taking over the assets of several bankrupt companies, including Thorburn & Messier owned by former premier Robert Thorburn. Baird's company subsequently grew into a major 20th century fish exporter. By 1901 Gordon, who previously had managed Baird's businesses, became a fun partner in the firm now known as Baird, Gordon & Co. Gordon died in February 1908 and the name of the firm was changed to James Baird, Ltd., with Baird's sons as managing partners. In October 1908 the firm's premises were again destroyed by fire and substantially rebuilt. Along with fellow merchants Moses Harvey and Augustus Harvey, Baird had been prominent in developing local industries in St. John's, having, as the Newfoundland Quarterly observed, "a finger in every pie." Among his holdings were shares in boot and shoe, wooden and clothing factories, a bakery, a nail foundry, and the Colonial Cordage Company, a local company started by Monroe. He was also active in the sealing and whaling industries. Baird was president of the St. John's Gas Light Company which by 1914 was generally regarded as the most secure of local investments in Newfoundland. Baird is best known in Newfoundland history for his role in the famous "Baird v Walker" case of 1890; earning himself the title of "Newfoundland's Hampden". In 1889 he purchased the mortgage to a lobster factory on the island's west coast wher France had historic fishing rights. In 1890 the factory was closed by Sir Baldwin Walker of the British navy under the terms of a modus vivendi reached for the 1890 fishing season between France and Britain prohibiting the erection of new lobster factories after 1 July 1889 by Newfoundland fishing interests on what was known locally as the French Shore part of the island. Walker had acceded to a French request that the factory be closed because the French held that it had been erected after 1 July 1889. Baird in 1890 sued Walker in the Newfoundland Supreme Court for approximately $5,000 in damages for the loss of business resulting from the factory's closure. The court found for Baird against Walker noting that the latter had no legal authority to close the factory. The imperial legislation under which Walker had acted was no longer in force in Newfoundland and there was nothing short of new imperial legislation the British government could do to prevent Newfoundlanders from fishing on the French Shore. Walker appealed on behalf of the Imperial Government to the Privy Council where Baird once again fought his case and won. Baird's action was a significant political and constitutional victory for Newfoundland in its long dispute widh both Britain and France over French historic fishing rights in Newfoundland, an issue that was finally settled in 1904 as part of a broader French-British agreement on colonial issues. Baird's also rallied a demoralized Tory opposition, unofficially led by Moses Monroe, that had been crushed by Liberal leader William Whiteway's electoral victory in 1889 over Robert Thorburn. 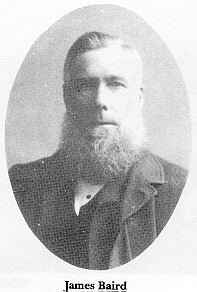 In 1898 the newly-elected Tory Government of James S. Winter appointed him to the Legislative Council, where he served until his death on 30 May 1915. (The author would like to acknowledge the assistance of David Baird in the preparation of this article).